Polk Youth Institution, Butner, N.C. 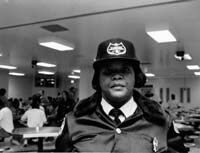 It's a cliché among correctional officers; the kind of thing you hear in every state in the country. The officers say they are serving time just like the inmates, they just do it in eight hour shifts. More than 300 officers work at Polk Youth Institution. A few have been on the job for more than 20 years, but many more quit in the first month. At Polk, if you've stayed on the job for more than a year, you're considered an old timer. Sergeant Furman Camel is retiring after 27 years in the system. Officer Maime Townes is completing her new officer training. Officer Charles Kennedy complains that, these days, prison is almost like a Ramada Inn. Officer Alicia Covington remembers the day her son walked through the gate, as an inmate. This story profiles some of the men and women who work at Polk Youth Institution in Butner, North Carolina. The officers use their tape recorders to document life on the other side of the bars: roll call, new officer training, lockdown, and the occasional one-on-one moments with inmates. Hear the correction officers' stories on All Things Considered. No inmate comes in unless they come through Receiving. This is the starting point. And I'm going to be the first face you see when you come, and the last one to see when you leave. A lot of times I'm just the meanest person in the world. But my objective is to help. When he comes off that bus, he's got a different attitude. He's used to doing what he wants to do, when he wants to do it. Here it's 'yes sir, no sir'. I believe that's the first part of rehabilitation. Then you start from there. --Sergeant Furman Camel, Polk Youth Institution, Butner, N.C.